What a jam packed weekend. From the boring domestic bliss chores (we have a daily tsunami episode with our 4 kids! Cleaning is my every second of every minute duty!) so I couldn't wait to spend the rest of the weekend outdoors!!! From walking, bike riding, my pilates workout early Saturday morning to spending the entire Sunday afternoon surfing. It was fab! It's been a little while since I went out for a paddle, as I'm typically playing with the girls on the beach but today I got to hang out with the boys and Mietta decided to go in too! 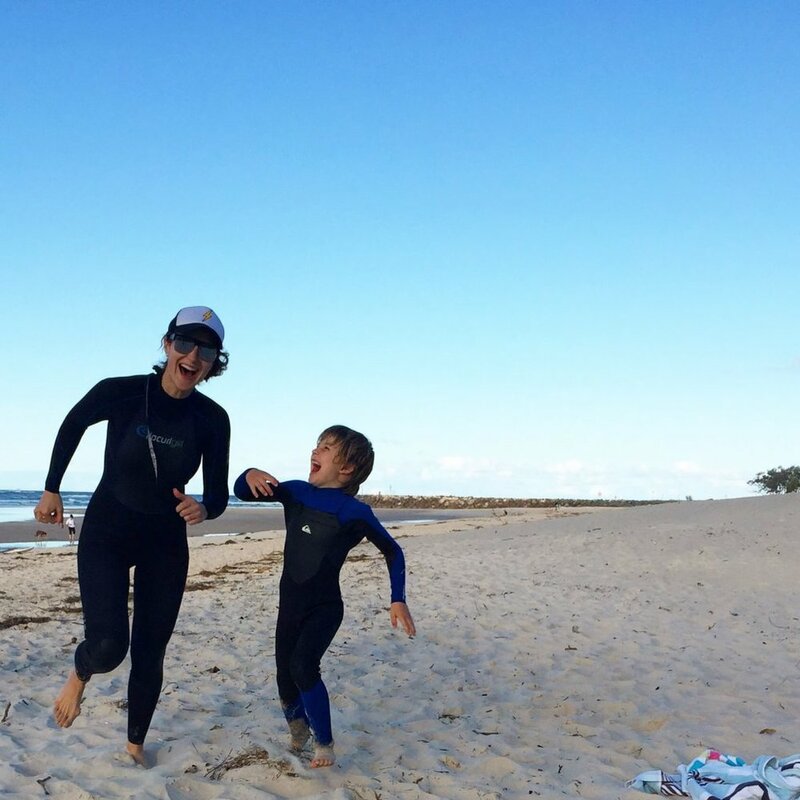 Surfing is such a popular family activity for us and gets us all together while promoting good health and wellbeing, including cardiovascular fitness, as well as strength in the core, back, shoulders and legs. Boy! Did I feel it in my arms with all that paddling. I do encourage you to take lessons to learn the correct surfing technique to get you started, lucky me I have Adrian that's a great surfing teacher so we get special one-on-one training. You should be a strong swimmer and always be aware of the safety aspects of being in the surf, which is why we have enrolled our kids into nippers at our local Surf Life Saving Club. After our surf, we built sand castles, collected shells and laughed hysterically as we played tiggy and did some soft sand shuttle runs. Chop herbs and whisk together with eggs. Add salt and pepper. Gently fry in a non stick pan and serve on top of toast. Serves 2. Super tasty and done in only minutes! It's now a breakfast Adrian is confident in making when I am not around to supervise. How was your weekend and what did you get up to? I hope you are enjoying the fresh air and this months STEP IT UP monthly challenge. Transformation Tuesday with Philippa Mann!